Dr. Stone (left) walks with a group of Summer Pediatric Research Scholars. 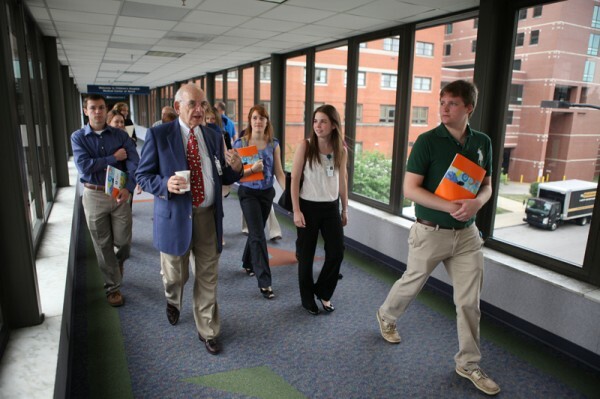 The students – college sophomores or juniors who are interested in careers in medical-related fields – conduct research projects mentored by doctors, surgeons, pharmacologists and others. A simple request from a local high school student writing an English paper uncovered some inspiring thoughts from a well-respected and highly regarded pediatrician at Akron Children’s. Dr. Robert Stone was more than happy to take a few minutes to enlighten the next generation of pediatricians, which is a role he has done for years by educating medical students and residents. With a career that spans 42 years, he has many experiences to share. 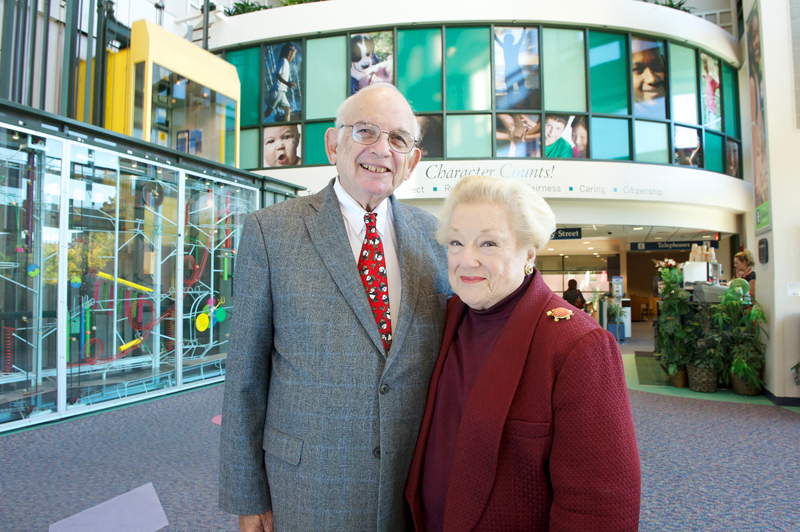 Dr. Stone has been instrumental in helping the hospital grow from humble beginnings to a nationally ranked children’s hospital with programs and services in more than 80 locations. 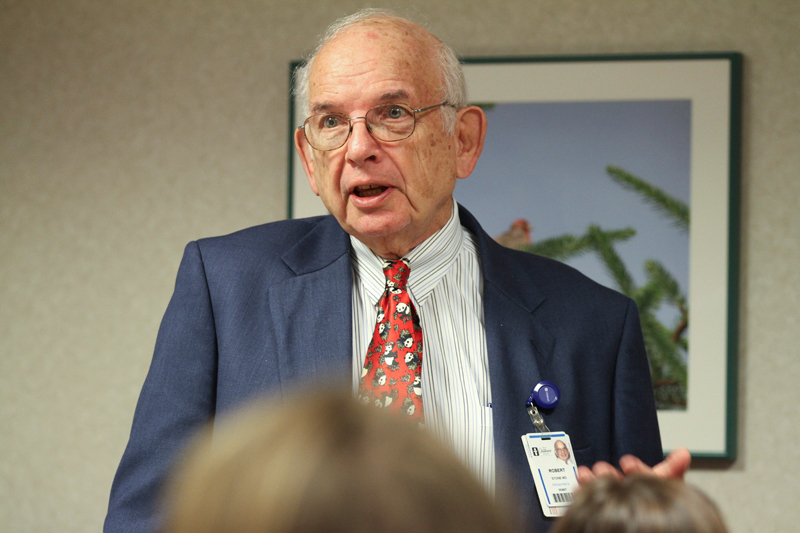 He has had a seat on the hospital’s Board of Directors since 1982 and is the namesake of the hospital’s respiratory center. Dr. Stone (center) enjoys mentoring students who are interested in pursuing medicine. 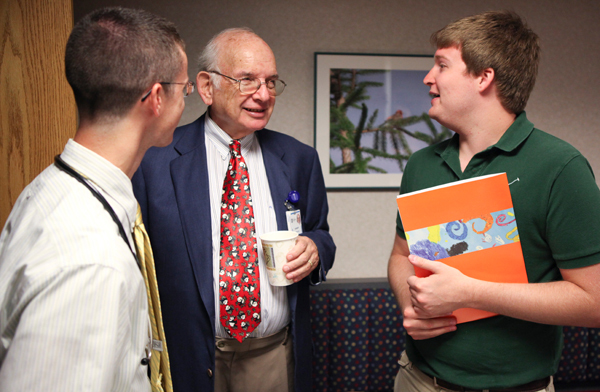 In 2002, Dr. Stone was named “Pediatrician of the Year” by the Ohio Chapter of the American Academy of Pediatrics. Here’s what Dr. Stone had to share with an aspiring medical school student during a recent email interaction. STUDENT: What made you decide to become a pediatrician? DR. STONE: As I grew up, I always wanted to be a doctor. I had a terrible case of poison ivy around age 8-9 that was everywhere on my body. My pediatrician Noah Miller made house calls 3 times a week for most of the summer. This was before steroids were available, which would have cleared things up in a few days. He really helped me feel much better. I decided then pediatrics was for me. STUDENT: In your opinion, what personality traits are important for success in becoming a pediatrician? DR. STONE: I think the most important thing is being flexible and the ability to deal with whatever happens next. You may go into one exam room to see a new baby and really be able to help the parents deal with their anxieties with a sense of humor. The next room may have a very ill child or a teenager who is anxious about school, personal inter-relationships, etc., and hopefully you can help him see the forest for the trees. STUDENT: What do you like most about your job? 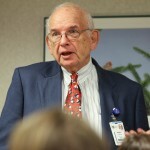 DR. STONE: The greatest joy of pediatrics is to help an infant grow to a self-sufficient, competent adult. And if you are really lucky, you can care for the second generation or sometimes a third generation of one family. STUDENT: How many years did it take for you to become a pediatrician? DR. STONE: After college, you go to medical school for 4 years and then start a 3-year residency in pediatrics. Then you will decide whether to become a subspecialist or a general pediatrician. I went to Miami University for 3 years and to medical school at Ohio State University. I took early admission, which allowed me to get a BS/MD upon graduation. Then I did a residency at Akron Children’s Hospital, followed by 2 years as a staff pediatrician at US Naval Hospital/Memphis – which was a big general hospital with a small pediatric unit. I then did a postdoctoral fellowship in pediatric gastroenterology at The Children’s Hospital of Philadelphia. I was married after my second year of medical school (see what I mean about your desires and social situations!). When I came back to Akron to practice, I was 28 years old so although it seems like a long time, it really flew by because it was fun, exciting and I was doing what I wanted to do. STUDENT: How much did it cost you to go to medical school? DR. STONE: College is not cheap so try for scholarships. Medical school costs depend on whether you attend a state-funded medical school or go to a private school. Medical schools offer some financial aid. To get an idea of costs check the individual medical school’s website or Google “medical school costs.” Also, some pre-med students sign up with the military, so the military will pay their way through school. STUDENT: How much do pediatricians make a year on average? DR. STONE: The financial aspects of a career are really the least important aspects of what you are going to do with your life, but, obviously, you need to plan for your family and their needs. Any area of medicine is too hard to enter for financial reasons. Starting salaries are around $110,000-$120,000, but that has no meaning because things change so much. As an intern, I was paid $3,000 a year. As a Navy pediatrician, I was paid $15,000 and felt like a millionaire! DR. STONE: Where you end up working depends on your own desires, your family and your social situation. STUDENT: From the research I have done, I heard that even if you apply for medical school and you get a good grade not everyone can get in. Is that true? If yes, what preparation should you do ahead of time so you have a higher chance to get into medical school? DR. STONE: Entrance to medical school depends on a number of factors including GPA (grade point average) from college; non-academic interests such as music, dance, sports, debate, etc. ; and your ability to interview orally. I advise students to be honest and answer as well as possible. You cannot go wrong by answering that you are interested in primary care but may consider another area such as surgery, etc. Great to see Dr. Stone still active and teaching! 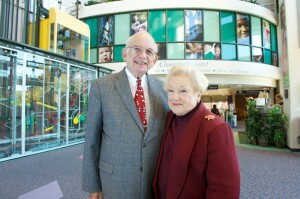 Dr. Stone was my children’s pediatrician. He was always calm, and he warmly dispensed advice with a mix of medical expertise and common sense. My babies also had mild GI issues so benefitted from his specialized training. What a wonderful doctor he is!